To begin you will need to set your instant pot to the SAUTE function. Allow the insert to get hot. Add a little oil to the hot insert to prevent the food from sticking. Now add the ham and brown. I am using leftover ham steak here, but you can use leftover ham, deli ham, whatever kind of ham you have on hand. Once the ham has browned you will add the carrot, celery, onion, and garlic to the insert. Sauté for 3-4 minutes until the vegetables are tender and the onions are translucent. Add the salt, pepper, and Italian seasoning. I used frozen corn because that is what I had, but fresh or canned will work as well. Peas to the instant pot as well. Again, I used canned because that is what I had, but fresh or frozen will work. Add in the chicken broth and give everything a stir. Hit cancel to turn off the sauté setting. Now hit the MAUNAL button and set the timer to 15 minutes. Remember it takes about 10 minutes for the Instant pot to come to pressure before it starts cooking. You know it's cooking when the timer starts counting down. After the 15 minute cooking time has elapsed, turn the valve to VENTING for a quick release. While the pressure is releasing whisk together the cornstarch and heavy cream. This is what makes the chowder thick and creamy. Once the pressure has finished releasing remove the lid. This is what the chowder will look like. Now you will press the Sauté button. Pour in the cornstarch and cream mixture into the chowder and give it all a stir. 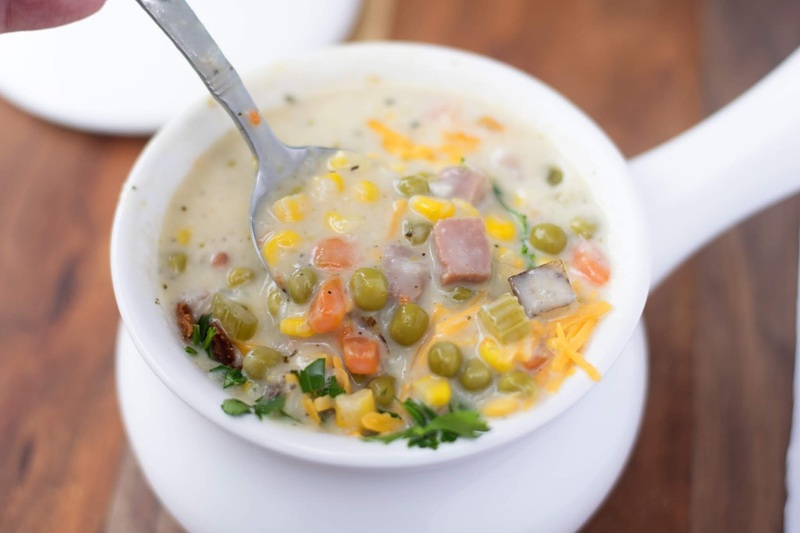 Bring to a simmer and allow the ham and corn chowder to become thick and creamy, about 5 minutes. 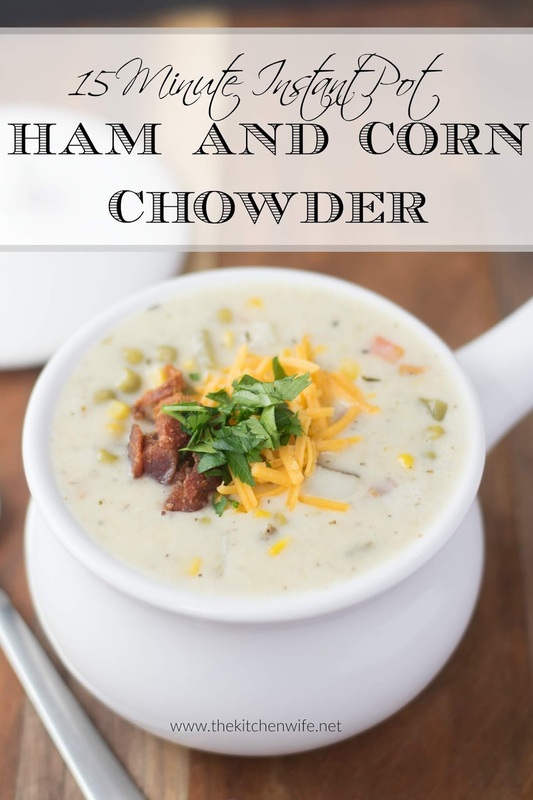 And there you have it a delicious, creamy, 15 Minute Instant Pot Ham and Corn Chowder! I like to top mine with some cheese, bacon, and fresh parsley. It's pack full of veggies and flavor and I know you're gonna love it! It couldn't be more simple so get in the kitchen and give it a try TONIGHT! For the traditional instructions for this recipe see the notes section on the printable recipe below. 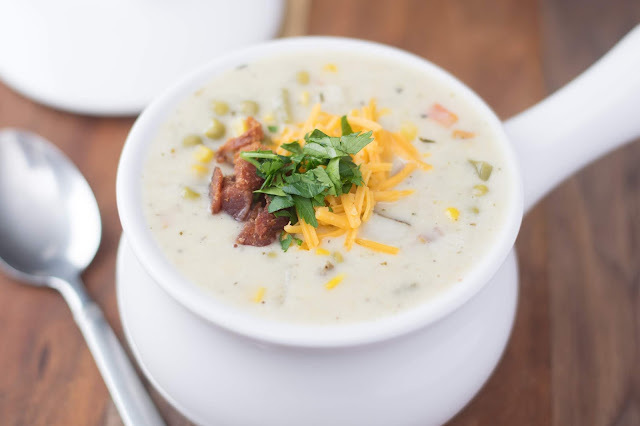 Have a delicious, warm, and creamy Ham and Corn Chowder on the table in 15 minutes with your Instant Pot! You're gonna love it so give it a try! To begin, press the sauté button on the Instant Pot and allow the insert to get how. Once hot, add a little oil to the insert. Add the ham and brown. Add the carrots, celery, onion, and garlic. Sauté until soft and translucent, about 4 minutes. Add the corn, potatoes, and peas. Place the lid on the Instant Pot, making sure the valve is set to SEALING. After the 15 minute cooking time has elapsed turn the valve to VENTING doing a quick release. While the pressure is releasing whisk together the heavy cream and cornstarch. When the quick release has finished, remove the lid and press the SAUTE button. 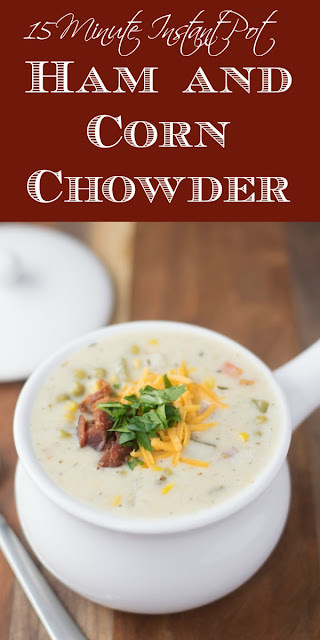 Pour in the cream and cornstarch mixture into the Instant Pot and let simmer until the chowder becomes thick and creamy. *Remember it takes about 10 minutes for the Instant Pot to come to pressure. 1. In a large soup pot add a little oil and place over a medium/high heat. Allow the pot to get hot. 2. Once hot, add the ham and brown. 3. Add the carrots, celery, onion, and garlic. Sauté until soft and translucent. 4. Add the corn, potatoes, peas, salt, pepper, and Italian seasoning. 5. Pour in the chicken broth. Bring to a simmer and cook for 20 minutes. 6. Whisk together cream and cornstarch. Pour into soup. Simmer for about 10 minutes.